Small Business Saturday is November 24th, and the Chamber is celebrating local business throughout the month of November and encouraging people to #ShopSantaMaria. PCPA Theatre is a great local option for entertainment. Located on Allan Hancock College Campus, the local theatre puts on a variety of impressive productions throughout the year. They are presenting that wonderful family musical, Peter Pan Nov 8-Dec 23, and encourage you to Fly off to Neverland with Peter and Wendy! Learn more at www.pcpa.org. “Shopping local is important because if the local businesses are thriving everyone in the community is thriving,” said Maria Centrella of PCPA. Help support our local businesses and local arts by checking out a production at PCPA Theatre! 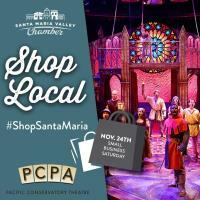 And make sure you #shopsantamaria this holiday season!